Things got WEiRED on June 15th and 16th. At the invitation of the WEiRED (Women Entrepreneurs, Innovators, and Regional Ecosystem Development) research group, over 50 women representing an international consortium of researchers, government and industry representatives, start-up founders, and students met at Communitech to share the latest research on and discussion new areas of research that will advance women’s entrepreneurship and innovation. The research was supported by a SSHRC Connections grant entitled “From Exception to Rule: Advancing the Role of Women Innovators and Entrepreneurs in Regional Innovation Ecosystems”, as well as Wilfrid Laurier, AGE-WELL, the Lazaridis School, and Communitech. The goal of the project was to understand how women entrepreneurs impact and are impacted by regional innovation ecosystems. Day one started with an inspiring welcome by the incoming president and Vice-Chancellor of Wilfrid Laurier University, Dr. Deborah MacLatchy. The morning theme “Women entrepreneurs & innovators: An international perspective” included international researchers to set the tone and spur discussion for a lively group activity (pictured below). Building on the morning’s learnings, the afternoon theme, “Women entrepreneurs & innovators: A regional perspective” highlighted the importance of ecosystems for collaboration and growth in local clusters. Day one of the symposium ended with an opportunity for an exercise that allowed the group to come to consensus on which issues were most important. After lively discussions over dinner with new friends, day two opened with an address from Catherine Fife, Member of Provincial Parliament for the riding of Kitchener-Waterloo. The theme for Day 2, “Women and Entrepreneurship from a sectoral perspective: health and agetech” generated some fervent discussion. Most participants were in agreement around the need for innovation in the health and aging sectors. They hear from experts in aging, practitioners running women’s entrepreneurship programs in incubators, and professional schools that encourage women and workers in gendered professions such as nursing. The organizing team is working on next steps, including future collaborations on grants and partnerships. DRiVE is grateful for all the support from partners as well as the student volunteers who worked to pull this amazing event together. Check out #weiredproject #weired2017 #kwinnovation on Twitter for participants’ perspectives throughout the symposium. And now for something really WEiRED! Gender equality has been an issue for western governments as far back as the 70’s (despite laudable activism prior to that in many regions). Now, if it was as simple as passing a bill, you’d expect to see trampled barriers across the traditionally gendered disciplines and professions. But we don’t. Statistics Canada’s 2011 report “Gender differences in science, technology, engineering, mathematics and computer science (STEM) programs at university” points out that the majority of university graduates are women. Yet despite years of acknowledging the wasted opportunity that this inequality represents, amongst graduates 25-34 only 23% of students graduating from engineering are women, and 30% from math and computer science. So what, you say? Women are rocking it in the arts and social sciences. Here’s the rub. The median wages of engineering and computer science graduates exceed those of others. Catalyst reports that women in these fields are more likely than their male colleagues to leave the industry within a year if they do get the job. And this gender gap follows women right to the top - in 2013 Credit Suisse reported that 41% of technology companies had NO women directors. You have to believe that those women who DO persevere would be sought after representatives of where the industry is going. Not so fast. If you relied on tech industry panels as a place where women might pop up, think again. They are predominantly…well, male. Deloitte generously refers to this and other practices as unconscious bias, others as outright sexism. Either way it’s time to act. Diverse teams perform better. Period. On June 14th and 15th a number of DRiVE researchers and colleagues, in partnership with the Fierce Founders group at Communitech, are bringing international experts on women and entrepreneurship/innovation to Kitchener/Waterloo, along with invited stakeholders from government, research, industry, civic groups and the health and agetech sector, to discuss women innovators and entrepreneurs, and the barriers and enablers of success that they experience within their local regions. Our second day will be devoted to a deep dive into the health and agetech sector where the likelihood that our systems will survive the onslaught of a rapidly aging and ailing population without mobilizing ALL the human capital in them, is slim. Dr. Barb Orser (Canada), author of Feminine Capital, Unlocking the Power of Women Entrepreneurs, Dr. Tatiana Manolova (US), author of Entrepreneurial Ecosystems and Growth of Women’s Entrepreneurship, Susan Marlow (UK), will help lead our thought process, along with members of the WEiRED research team (Women Entrepreneurs, innovation and Regional Ecosystem Development) who are organizing the symposium, and a crowd of key stakeholders. Our goal is to build a research consortium, in partnership with other invited partners, that will help provide international evidence of programs that work and those that don’t to improve gender parity in the pipeline that produces then commercializes disruptive innovations. She might have noted the irony that SWAN (Scientific Women's Academic Network) is the acronym used by the British Equality Challenge Unit that recognises those who are working to implement practices that advance gender equality through more balanced representation and professional advancement. Most women working in the STEMM (Science, Technology, Engineering, Medicine & Mathematics) fields will tell you that the single emerging swan remains a myth. Systemic barriers to women entering and most importantly remaining in many (not all) of these fields remain deeply entrenched despite decades of acknowledgement about the issue and many, often unsuccessful, policies and programmes intended to address it. Perhaps, rather than the myth of the an ugly duckling emerging into a swan, a flock of confident ducklings is what’s required from which gaggles of ducks can emerge whose roles are normalized, and accepted. 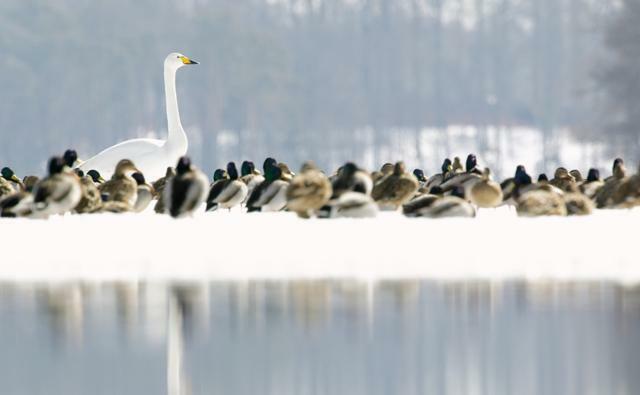 Protective policies, and regional ecosystems that provide networks and mentors, and the resources for the ducks to develop resilience and produce many swans, are what’s needed. Here in Cambridge (UK), DRiVE was alerted to the Athena SWAN network by Dr. Michael Wakelam, the Director of the Babraham Institute. Babraham was awarded an Athena SWAN award in 2015. Dr. Wakelam recognized that there was gender parity in their programs to the postdoctoral level, but beyond that the numbers of women applying for and securing junior faculty positions was limited. The institute has committed to broad policies and practices to address this imbalance. From standardizing job applications and recruitment questions to providing cover for postdocs taking maternity leave. While policy and women-friendly cultures are important in the graduate programs, the pool of applicants is determined by the success of recruitment into undergraduate STEMM programs. In 2014, women made up only 27% and 24% of the students in engineering and math, unchanged from 2011. Their acceptance into computer science was an abysmal 16%, though admittedly this was up from the 2.9% just three years earlier. Clearly, the pace of protective mechanisms to ensure that women in STEMM have the support of a critical mass that’s required to start producing swans, must pick up. STEMM careers are increasingly abundant. Cambridge, in an effort to mitigate any post-Brexit human resource short falls in the popular software development and business analyst positions, might look to gender equity in their STEMM programs as a solid insurance policy. Understanding the relationship between women’s entrepreneurship and regional innovation ecosystems! An international team of researchers (Canada, Germany, Chile and the U.K.), including Drs Josephine McMurray, Katherina Kuschel, Heidi Sveistrup and Judith Sixsmith from the AGE-WELL NCE, have just completed an application to SSHRC for the Connection Grant. If successful, the Women Entrepreneurs, innovation and Regional Ecosystem Development (WEiRED) collaborative project will bring together international experts with an interest in women in entrepreneurship, health and age tech, and regional innovation ecosystems. The project has its genesis in the AGE-WELL DRiVE project led by Dr. McMurray and Dr. Sveistrup, and will address the critical gap between our theoretical and empirical understanding of systemic barriers to women’s participation in innovation and entrepreneurial activities. Who is part of the organizing team? Drs Josephine McMurray (Wilfrid Laurier University, Canada), Katherina Kuschel (Wilfrid Laurier University, Canada), Kerstin Ettl (Siegen University, Germany), Vesna Mandakovic Universidad del Desarrollo, Chile), Judith Sixsmith (University of Northampton, U.K.), and Heidi Sveistrup (University of Ottawa, Canada) are the symposium organizers. As leaders in related disciplines (regional innovation ecosystems, women and entrepreneurship) these researchers have developed an impressive network of external partners from other universities and research institutes, government, industry, non-governmental organizations and civil society. Their facilitation of this symposium will play a vital role in not only enhancing research collaborations, but also in furthering the international discourse on women entrepreneurs and regional innovation ecosystems. A post-symposium workshop on June 17th will bring together partners interested in pursuing new areas of research identified at the symposium. WEiRED has prepared a scoping review for the 2017 DIANA Conference (USA), a conceptual paper for the Conference of Economic, Technological, and Societal Impacts of Entrepreneurial Ecosystems (Germany), and a PDW proposal on women techpreneurs for the 2017 Academy of Management Conference (USA).